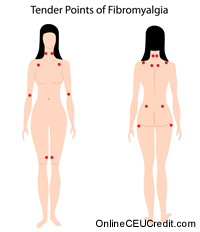 Patients with fibromyalgia syndrome (FM) have a wide variety of physical (pain, fatigue, etc.) and psychological (memory problems, mood disturbances, lack of well being, etc.) symptoms. The etiology and the pathophysiologic mechanisms of the disease are still obscure. Recent advances suggest aberrant central pain processing mechanisms and a pathological interaction of central nervous system, neuroendocrine system and musculoskeletal system [1-4]. Regarding this uncertainty, treatment remains a challenge and most of the improvements gained after treatments are often short-lived. The multidimensional nature of the disease calls for a wide variety of treatment approaches. Pharmacological therapy remains the primary treatment choice for FM. Tricyclic antidepressants, non-steroidal anti-inflammatory drugs, simple analgesics and selective serotonin reuptake inhibitors are the most often prescribed medications [5, 6], but there is no long term efficacy of these medications. The uncertain pathophysiology of FM and the lack of long term effectiveness of pharmacological treatments require other therapeutic modalities since biomedical model solely may be insufficient to explain the complexity of FM. In the recent years biopsychosocial model is suggested as a useful model to understand and to treat chronic pain [7, 8]. In the biopsychosocial model the perception of pain is an integration of biological and psychological properties and successful treatment includes this integration . Thus, besides pharmacotherapy other modalities such as; multi- disciplinary rehabilitation, physical interventions, educational programs, cognitive-behavioral strategies, coping skills training, complementary and alternative medicine therapies are used. Cognitive behavioral treatment (CBT) of chronic pain involves different set of specific skills which address the sensory, cognitive and behavioral components of pain . Over the last 20 years there has been an increasing number of reports on CBT to treat rheumatological conditions including low back pain , temporomandibular joint , rheumatoid arthritis [74-76], osteoarthritis [77, 78] and FM [36, 71, 79-82]. 1) An educational phase; to help patients to understand the effects of thoughts, beliefs, expectations and behaviorson their symptoms (biopsychosocial model). The main purposes of educational phase are to understand how and why self management skills can be helpful in managing pain, to help patients and their family members begin to change negative perceptions about their abilities and to provide the active collaboration of patients and their families. 2) A skills training phase; patients are emphasized on cognitive and behavioral strategies for coping pain. Various cognitive strategies help to ameliorate pain. Coping skills training is a set of techniques that a person may use to modulate pain. Cognitive behavioral techniques and skills practice include; relaxation strategies (deep breathing, meditation, biofeedback, visual imagery), coping strategies (self task, problem solving, distraction reinterpreting) and cognitive restructuring. In this phase the patients are encouraged to modify maladaptive pain behaviors and to apply the behaviors and cognitions effectively in their environments. 3) An application phase; patients learn to apply cognitive and behavioral skills to real life situations. In this phase relapse prevention is aimed. Relapse prevention education includes: a) to identify high risk situations b) to identify signs of relapse c) rehearsal for coping with early relapse signs . Behavior modification focuses on changing the behavior itself whereas cognitive restructuring focuses on altering the psychosocial attitudes or cognitions of patients. For behavioral changes reminders or boosters should be included in the treatment plan so that the patients maintain the use of the skills they have learned . 1) Cognitive behavioral strategies in the studies are multidisciplinary treatment programs that combine educational information, pharmacological interventions and exercise therapy. Although multidisciplinary team program have been shown to be effective over pain, little is known about which components in the program are the most effective. The effectiveness of CBT depends on therapist, treatment and patient characteristics . The patient’s willingness to adopt a certain new behavior is described as ‘readiness to change’ . Also clinicians need to recognize that patients may be at different stages of readiness to learn or to adapt their behavior to change cognitions, symptom severity and skepticism about the diagnosis . Prochoska and colleagues summaries stages of change with applications on an active coping style for managing arthritis [87, 88]. Six predictable stages in the behavior change process have been described: 1) precontemplation stage; the person lacks of information about the need to change or resist to change 2) contemplation stage; the person is trying to understand the problem and interference with functioning 3) preparation stage; the person begins to be ready to make change 4) action stage; the person is actually making change in behavior 5) maintenance stage; the person has made changes. Dijkstra and colleagues studied readiness to adopt the self management approach to cope pain in FM . In this study, the data suggest that improvements in operationalizations of the precontemplation and action dimensions of readiness to change are needed in Dutch population. Prochoska has noticed that educational interventions may be helpful in enabling individuals who are ready to make changes in their own behavior. 2) The timing of the CBT is an important issue. Although CBT has been shown to be effective in long standing disease with arthritis , further research for early or late intervention with CBT in FM is needed. 3) Format of the CBT sessions (group or individual therapy, duration and the number of the session) and by whom it would be conducted (trained psychologist, rheumatologist, nurse educators, etc.) and different outcomes to evaluate the efficacy of treatment are noteworthy issues. Many of the CBT protocols for pain management are flexible. Prior to CBT the patients’ psychological evaluation (to assess patients’ cognitive, behavioral and affective adaptation to their pain condition) are important. Turk [91, 92] examined whether patients with FM could be classified into subgroups based upon their pretreatment responses on the Multidimensional Pain Inventory (MPI). According to their MPI profiles patients with FM were classified as Dysfunctional (DYS); high levels of pain, functional limitations and affective distress, Interpersonally Distressed (ID); this group characteristics are similar to DYS but they have low levels of support from their significant the others and Adaptive Copers (AC); low level of pain, distress and disability. Turk hypothesized that the MPI subgroups would response differently to a standard rehabilitation program [93, 94]. When The MPI subgroups were examined separately, patients in DYS group improved in pain, depression, fatigue, but ID patients with FM failed to respond to the treatment. This study’s results support the need for different treatments targeting the characteristics of subgroups. Over the last 15 years there has been an increasing number of studies on CBT for FM [36, 71, 79-82, 95, 96]. In most of the studies, CBT were combined with the other pharmacological and non-pharmacological interventions. Using CBT as a single modality compared with waiting list, Kaplan and colleagues evaluated the effects of stress reduction techniques . In this study patients with FM included in a CBT supported stress reduction program, showed 20% improvement in controlling pain and 37% reduction in psychological distress. Nielson et al. evaluated the CBT as an inpatient program. The results showed that significant reductions in pain, pain behavior and emotional distress and improvements in control over pain were obtained . In a follow up study of the same patients, the patients’ therapeutic gains were maintained 30 months after CBT . Keel studied the effects of relaxation compared to relaxation combined education, pain coping skills, social supports and exercise. Each group contained 16 patients and both groups were trained for 15 weeks. Treatment efficacy was determined on the basis of improvements observed in the three of six outcome measurements (medication use, physical therapy, sleep improvement, pain rating and symptoms checklist and global assessment of change). At the end of the study, 31% of the combined group showed improvement. There was no success in the relaxation group . In this study, sample size was small and CBT was applied as a combination therapy. Cognitive behavioral intervention for juvenile FM was studied by Walco . Seven girls were treated using CBT (relaxation, guided imagery). The results indicated that CBT was effective in reducing pain and improving functioning but the study sample was so small and the study did not include any control group. In another study, the authors assessed the behavioral and educational therapy . At the end of the study there was improvement in both groups but no differential effects between the two groups occurred over the course of trial. Potential efficacy of behavioral and educational approaches in reducing depression, myalgia scores and pain behaviors was observed in this study. The authors thought that participants had a high degree of educational attainment and these findings could not limit their generalizability to other FM populations. In a good controlled study Vlayen compared the three groups (group1: education + exercise + cognitive skills, 12 session in 6 weeks, group 2: education + exercise, group 3: wait listed control group). Assessments were done at baseline and 12 month follow up period. The authors concluded that treatment groups showed improvements on pain coping and controlling of the pain but there was no difference between the treatment groups. In another study CBT supported stress management was compared to aerobic exercise . Pain and tender point count improved in both groups. Exercise group was better than the stress management group in improving measures of fatigue and work capacity whereas stress management group was better than the exercise for depression. There are some studies supporting the benefits of combined exercise and CBT [38, 47, 66, 80]. The studies of Burckhardt  and Buckelew  are important in suggesting that the combined exercise and CBT have significant long term benefits. In a systematic review of randomized controlled trials of non-pharmacological interventions for FM, the authors thought that studies that used a combination approach showed greater improvement than those including single intervention only and FM is better managed by a multimodal approach including aerobic exercise and education to address physical, functional and psychological aspects of FM . A meta-analysis of 49 FM treatment outcome studies compared the efficacy of pharmacological and non-pharmacological treatments (CBT and physical therapy) with respect to physical status, FM symptoms, psychological status and functional ability. Antidepressive treatment showed significant improvements in all criteria as compared to physical therapy. In this metaanalysis, CBT was found more effective with respect to improvement in FM symptoms and functional ability. The authors concluded that an optimal treatment of FM includes CBT . Williams summarized that clinical studies of CBT in FM reported moderate improvement and CBT and exercise combination has synergistic benefits on course of FM . In summary, existing studies demonstrate the beneficial effect of CBT, but there is a need for larger, more systematic and randomized controlled trials to evaluate the effectiveness of cognitive behavioral methods of managing FM. - Kurtais, Y.; Exercise and cognitive-behavioral treatment in fibromyalgia syndrome; Current Pharmaceutical Design; 2006; Vol. 12; Issue 1. The Goal of this Home Study Course is to create a learning experience that enhances your clinical skills. We encourage you to discuss the Personal Reflection Journaling Activities, found at the end of each Section, with your colleagues. Thus, you are provided with an opportunity for a Group Discussion experience. Case Study examples might include: family background, socio-economic status, education, occupation, social/emotional issues, legal/financial issues, death/dying/health, home management, parenting, etc. as you deem appropriate. A Case Study is to be approximately 225 words in length. However, since the content of these Personal Reflection Journaling Exercises is intended for your future reference, they may contain confidential information and are to be applied as a work in progress. You will not be required to provide us with these Journaling Activities. The preceding section contained information about cognitive-behavioral treatment and exercise in fibromyalgia syndrome. Write three case study examples regarding how you might use the content of this section in your practice. According to Kurtais, what are the three components of cognitive-behavioral treatment? Record the letter of the correct answer the CEU Answer Booklet.